William Henry "Bill" Walsh (September 8, 1927 – May 13, 2012) was an American football center who played six seasons in the National Football League. Walsh was born in Phillipsburg, New Jersey, and attended the University of Notre Dame. ↑ Smith, Wilfird. "GRIDIRON HOPES OF 1945 IRISH REST ON FROSH: Loss of Szymanski Is Heavy Blow", Chicago Tribune, September 12, 1945. Accessed March 14, 2011. 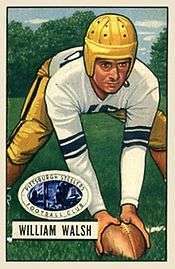 "Devore is concentrating on the development of Bill Walsh, a freshman from Phillipsburg, Pa., who truly is a great prospect..."
Frank, Reuben (May 16, 2012). "Former Eagles asst. Walsh dies at 84". CSN Philly. Retrieved 2012-05-19.